GreatFire.org and the BBC are using the "collateral freedom" approach to offer uncensored news within China. A Chinese-language BBC article, shown through a GreatFire.org mirror site. People are always looking for creative ways to get uncensored information in and out of China, and now transparency group GreatFire.org is working with the BBC to deliver the news organization’s Chinese-language reporting to people inside the country’s Great Firewall. The idea is to host the mirror sites through services that are so ubiquitous that it would be difficult, even for China, to justify blocking the entire domain. This technique has gained traction because China’s main mechanism for executing its censorship is using DNS spoofing to intentionally send users to the wrong IP addresses. GreatFire.org uses hosting options like Amazon Web Services to keep its mirror sites going. 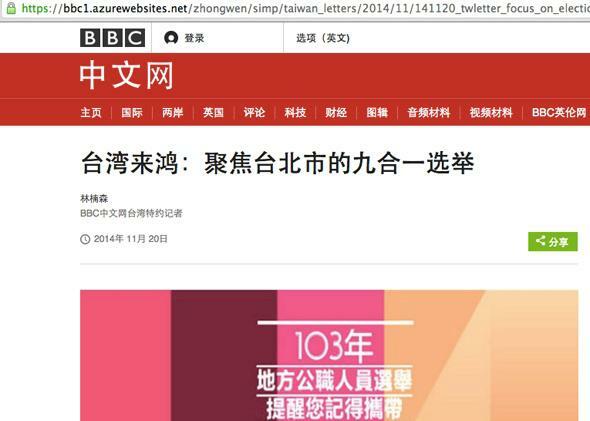 In a blog post published Monday, GreatFire.org explained that its partnership with the BBC is specifically pegged to elections in Taiwan on Nov. 29. The goal is to present diverse information that’s written in Chinese for Chinese audiences. As GreatFire.org points out, a lot of English speakers in China already use VPNs and other workarounds to access foreign media, but if they don’t know how to do this or speak only Chinese, these backdoors don’t help much. GreatFire.org’s mirroring apprach may not be a stable solution long-term. As Gigaom notes, the group reported censorship attempts on some of its mirror sites just last week. But for now it’s a clever workaround to try to get information into the country.